Altra's original neutral do-it-all shoe returns with exciting new upgrades. These upgrades include; extra rubber that wraps up to protect your toes, a decoupled heel to promote a soft landing with each step, and a modernized engineered mesh upper for a comfortable and secure fit. To top it all off, the updated midsole design gives this Fit4Her classic a fresh, sharp look. Features FootShape™ Toe Box FOOTSHAPE? TOE BOX Altra'sFootShape? Toe Box allows the toes to relax and spread out naturally and the big toe to remain in a straight position for maxium stability and power. Zero Drop™ Platform ZERO DROP? 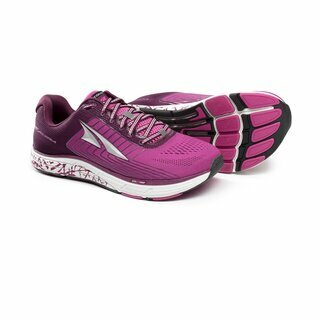 PLATFORM Every Altra shoe features a Zero Drop? Platform that places the heel and forefoot the same distance from the ground for natural alignment and a low-impact landing. Fit4Her™ FIT4HER? The Fit4Her? technology means we customize every women's shoe to the unique anatomy of the female foot. FootPod™ Technology FOOTPOD? TECHNOLOGY An outsole technology that actually maps the bones and tendons of your foot to help it bend and move naturally. InnerFlex™ INNERFLEX? Grid-like grooves in the midsole allow your foot to flex while being lighter, for more speed and better performance. A-Bound™ Cushioning A-BOUND? CUSHIONING A bouncy compound made of recycled material that protects your foot from hard surfaces and increases energy return.